The race to combine old-school luxury brands with modern technology is well and truly on, as today Montblanc joins Tag Heuer in rolling out its own Android​ Wear watch. The Montblanc Summit is the company’s first venture into the digital timekeeping world, bringing with it some of the expertise Montblanc has for crafting mechanical timepieces. 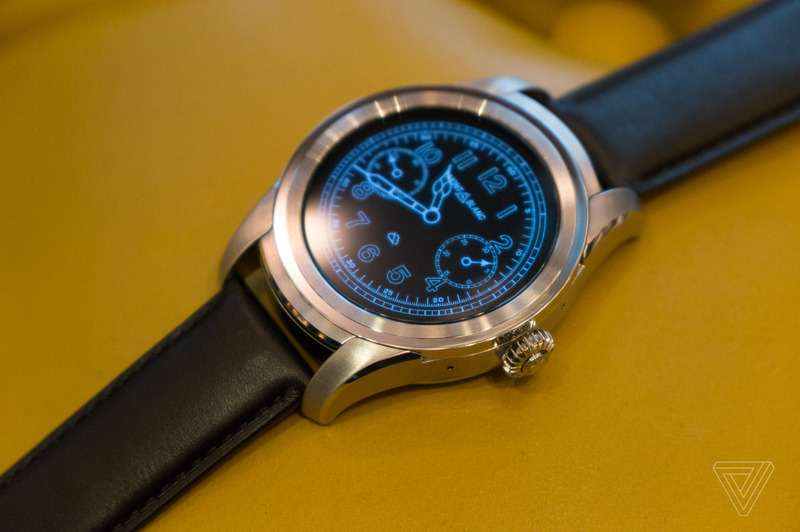 I got to see and wear this fancified Android Wear watch in London today, sitting down with Montblanc’s director of new technologies, Felix Obschonka, to discuss the thinking behind the Summit. Obschonka wears his own prototype Montblanc Summit with a sfumato brown leather strap and all-black stainless steel case. It’s a classy look, though at a 46mm diameter and a height of 12.5mm, it’s unmistakably a large watch. Some people like that. This is also very definitely a luxury watch, with a starting price of $890 ($930 if you opt for the sfumato leather). The so-called satinated finish on slivers of the Summit’s surface is basically a rich person’s version of chamfering, catching the light attractively and accentuating the gentle slopes of the watch’s frame. The naturally colored stainless steel case shows this off better than the black version. And if you can’t pick between the two, Montblanc also blends them into a third two-tone option. Or maybe you’d prefer titanium? That costs $980 with the basic strap or $1,020 with an upgraded one. Strap choices range from the cheapest, which is black calf leather, through a palette of colorful caoutchouc — natural rubber, $930 price point — to brown alligator skin that maxes out the price, when paired with a titanium case, at $1,070. Up front is a domed sapphire glass cover protecting a 1.39-inch AMOLED display with 400 x 400 resolution. I’m lingering on the cosmetic aspects of this watch, because, in truth, that’s all that Montblanc can really put its signature on. 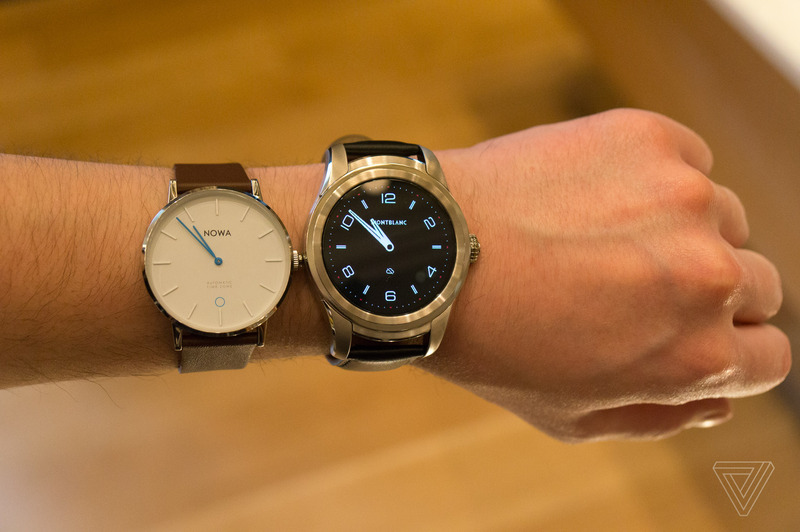 The Android Wear 2.0 software on board is standard-issue Google fare, except for the preloaded Foursquare, Uber, and Runtastic apps, some Montblanc watchfaces echoing its most iconic mechanical designs, and a World Timer app that feeds global times into the watch’s digital complications. In other words, if you’re looking for a uniquely luxurious user experience in terms of interface or capabilities, forget about it. You’ll get the same Google Assistant on the Summit that’s already available on the $349 LG Watch Sport. 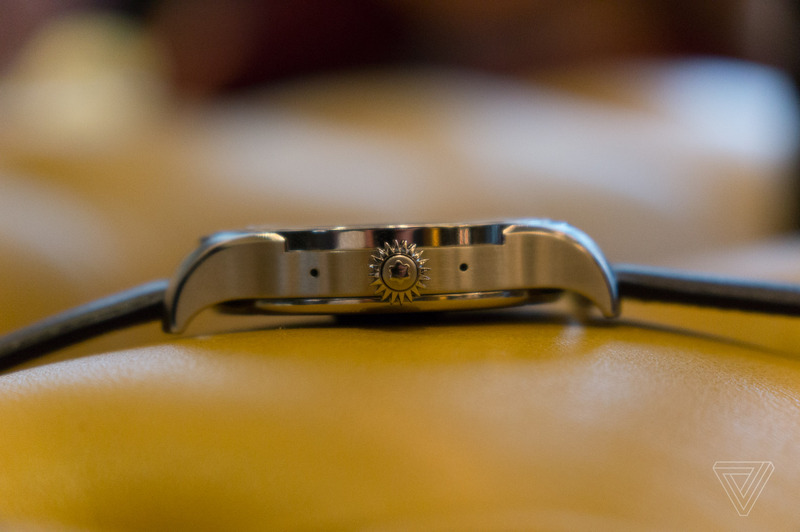 It may have the shape and look of a rotating watch crown, but it’s just a button. The Summit’s reason for being is that it’s made of a higher grade of materials and with more care and expertise than the typical LG alternative. And I think Montblanc can say that’s the case with confidence — however I don’t think the improvement in quality merits the hefty premium built into Summit’s $890 starting price. My main issue with the Montblanc Summit’s design is its extra large size. I’m conscious that it’s necessitated by wanting to fit a reasonable battery and an array of sensors, but the positive motivation doesn’t change this watch’s burdensome nature. You’ll never not know you’re wearing it. Then there’s the crown on the watch — or, rather, the thing shaped like a crown that is actually just a simple button. Obschonka tells me Montblanc weighed numerous interface ideas, including turning that button into a scrolling wheel for the screen, but ultimately the company decided that a single-button interface would be the most straightforward. Having used the Apple Watch’s digital crown and the rotating bezel on Samsung’s Gear S series, I have to respectfully disagree. The Summit uses a regular 22mm strap attachment. I do like the quality of the straps that Montblanc showed me. The leather ones require a bit of breaking in before they can sit comfortably, but I tried Obschonka’s well-worn prototype and it felt pretty great. I’m a bigger fan of the caoutchouc ones, which are supple, gentle, and extremely easy to wear. It seemed weird to me at first that the rubber option would be pricier than the leather, but Montblanc has indeed crafted a very nice little strap here. 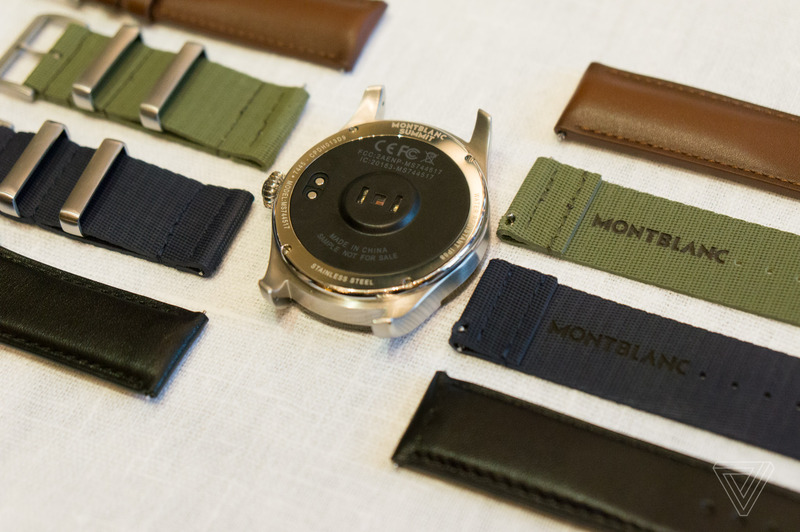 It’s also good to see a standard 22mm attachment for swapping straps, so you’re not bound to Montblanc’s range, which starts at $100 for a standalone calf leather strap, goes to $110 for caoutchouc or sfumato leather (also available in navy blue), and maxes out at $250 for the alligator strap. The Montblanc Summit is powered by a Qualcomm Snapdragon Wear 2100 processor with 512MB of RAM, 4GB of storage, a 300mAh battery, and a magnetic charging cradle. The latter connects to power via Micro USB, whereas I’d have very much liked to see Montblanc use the more modern USB-C connector on a product one would hope to keep using for multiple years into the future. I’m less bothered by the omission of LTE and GPS, two features that fatten out watches dramatically, but the absence of NFC for Android Pay is kind of a biggie. I can’t complain about the Summit’s sensors, though, as it offers the usual accelerometer, gyroscope, and heart rate monitor, along with a barometer and electronic compass for extra utility. The whole thing’s waterproof to an IP68 rating, which will be good enough for most circumstances, even if Obschonka doesn’t advise taking it for a swim. With a few extra touches of refinement — and definitely a smaller size and weight — I feel like this Montblanc watch could have been in Tag Heuer’s league of being very nice, albeit inadvisedly expensive. As it is, I find it too chunky, overwhelming even my distinctly average wrist, to be anything but an ostentatious showpiece — and the trouble for the Summit is that there are many better, analog showpiece watches out there already. The US and UK will get the Montblanc Summit first, starting in May, when men’s fashion retailer Mr. Porter will have a two-week exclusive on the watch. I did ask Obschonka about this being a male-oriented watch and he admitted that’s the case, but suggested there’s a surprising number of women who also favor wearing oversized watches. I guess I’d find that more convincing if the Summit was launching in a unisex store. Montblanc boutiques and other retail partners will follow across Europe, Canada, Mexico, South Africa, India, Taiwan, Japan, Korea, Australia, Singapore, Dubai, and the United Arab Emirates.